Owing to my inability to get rid of this flu, again a piecemeal entry. Having been relatively confined to the house, I have been dwelling on art and suburbia and home. There an interesting exhibition at the Walker Art Centre commented on over at Best of 3 about the impact of suburbia on art. Although I haven’t been to Auckland for a while I can only hope the type of American suburb this is mostly about isn’t too present here in New Zealand. I can’t knock NZ suburbs too much because I’ve almost always lived in one and they have served me well. Apart from a short time in Aro Valley that is, and Holloway Road is truly a little entity all of its own. 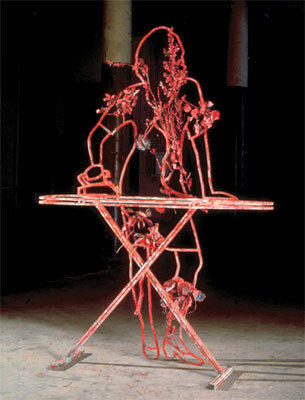 I found this at Art for Housewives “Aesthetics are homemade. That is, the formation of taste comes from the home. From homemakers. From our mothers. The way they feed us, the way they dress us, the way they decorate our homes. The way they care for us. Housewives are our first trendsetters. Because our childhood follows us throughout our lifetime. Like Proust’s madeleines.” That’s kind of a scary thought. So although I encourage ‘good art’ in our home, at this point I need to remind myself of reason #41 why I can’t own decent original artworks (just yet) which is “Oh dear, there’s vegemite on the McCahon again”. This is not just the territory of women artists either (for example Jacqueline Fahey, Joanna Margaret Paul) . 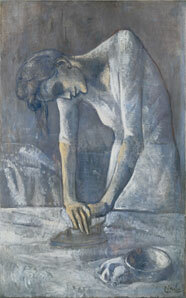 Even Picasso didn’t escape from ‘Domestica’ and sorry to harp on but Clairmont’s work was domestic subjects for a large part. Woman Ironing, Paris, spring 1904. I know its a bore, but has again made me challenge Hamish Keith’s assertion in “The Big Picture” that art is essentially an urban occupation. Of course there is a bad side and I get a bit fed up with the line of artistic endeavour by “trapped housewives” and in my own area I will scream if I see another painting of Kapiti Island (apologies to Rita Angus of course – who was a culprit with Waikanae). More on the subject of Public Art. 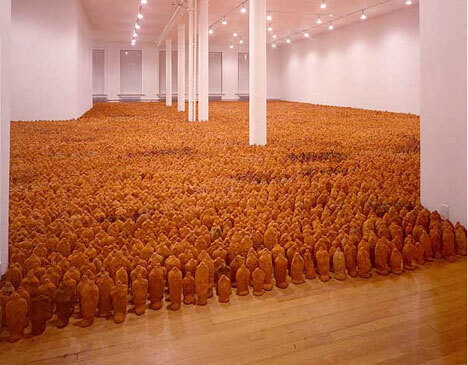 Antony Gormley (of the little clay people) says modern public artworks are crap. In the main I’d have to agree. I see ‘The Listener’ has another visual art ‘review’ which is good. However, yet again, I am confused. I don’t know if the writer has seen the Don Ramage Steel Jungle retrospective but the whole thing was descriptive rather than making any strong comment. Maybe this is how its meant to be with a retrospective? But to me its almost inline with the promotional material which says the show is “reintroducing his work a contemporary audience hungry for retro design heroes” – ugh! So to contrast and compare, I came across this review of the Tate Modern’s new show on Duchamp, Man Ray and Picabia. All respected names with a well known body of work, yet the author (Tom Lubbock) has something new and insightful to say. As I’ve said before though ‘what would I know’. Sorry to those who have been on the receiving end of me clicking the ‘send’ button too quickly (and too often) this last week. I will shut up now. Firstly, I have fixed all the broken links on former posts (I hope). A little editing trouble with my new blog. Well the holidays have brought some amazing TV viewing amongst the usual dross. “Lovely Rita“, the final episode of “The Big Picture” and “Being Billy Apple” were a few and so good to see (yay for The Charter). Being Billy Applewas also intriguing. I have seen a few Apple’s (I like NFS and Sold) but I didn’t realise he doesn’t actually paint them himself. See you can tell I have no education in this area. His work is so clever. It was interesting to see his personal evolution as an artist and artwork. You have to love the scrubbed floor installation and I finally clearly understand the meaning of ‘conceptual artist’. I guess I was a little disappointed in Hamish Keith’s final episode of The Big Picture. Maybe because I’d read the book or seen a critique of his braided river analogy. It left many questions. I wondered if John Walsh was excluded because of his association with Te Papa. Someoneiknow was also disappointed that he didn’t provide more context on the Militant Artists Union. We both disagreed with Keith’s issue with bi-culturalism. Although I agree New Zealand is definitely multi-cultural, the Treaty of Waitangi (our founding document) is between Maori and Tau Iwi (everyone else – or ‘other’). I am happy to say I recorded all of them but our TV reception is terrible so hopefully they will be out on DVD at some point.